Sierra de Baoruco Natl. Pk. illegal farming. 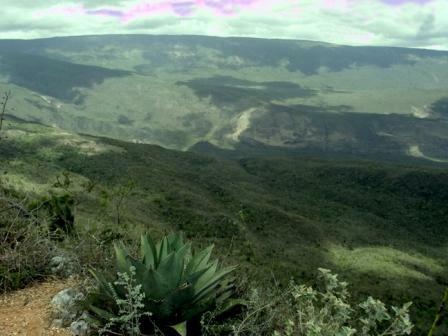 Santo Domingo.- Eight environmental organizations warned Tues. that the country’s protected areas are in grave danger from the Environment Ministry’s alleged complicity with an investor in national parks such as Valle Nuevo and Sierra de Bahoruco. In a press conference, the entities said Environment minister Ángel Estévez fails to enforce the law which protects those areas, and challenges the groups that denounce the devastations instead. They warned that they’ll continue to defend the protected areas and announced legal action to defend Sierra de Bahoruco and other areas in the next few days . Environmentalist Luis Carvajal and, Dominican Academy of Sciences president Luis Schecker Ortiz urged the Environmental Prosecutor to charge those who harm the protected areas. Present in the press conference were SOS Environment RD, Jaragua Group, Green Action, the Cibao Ecological Society, the Moscoso Puello Foundation and the Santo Domingo State University UASD Environmental Commission, among others.